Dan Painter has built a remarkable tiny town in the Warehouse Arts District, and he's the mayor. ST. PETERSBURG — You can’t type “tiny town” into your phone’s GPS app, or see it from the street driving through the confusing, industrial neighborhood where it hides. Instead, look for a patchwork fence of rusted sheet metal with the word “Painter” splashed across. You can’t call ahead because Dan Painter doesn’t have a phone, but if you pound long enough, Jojo the boxer will start to bark and eventually the affable mayor might come to the door. It can take so long that people think they’re in the wrong place. Taylor Labuda went looking for the town with her boyfriend. They stood banging the door knocker made from an old wrench for 20 minutes before a big guy came to the door in his boxer shorts. The first thing you see when visiting Tiny Town is WTNT, Tiny Town’s tiny radio station with the see-through broadcast booth big enough for one person. Then you see the barbershop with classic barber pole, the seafood restaurant where Dan had just cooked breakfast and the Sailfish Pier fishing pier, which has a boardwalk that’s the perfect size stage for a band. The body of an old Ford is permanently parked at the drive-in movie theater. The last movie to screen was Quentin Tarantino’s Death Proof. 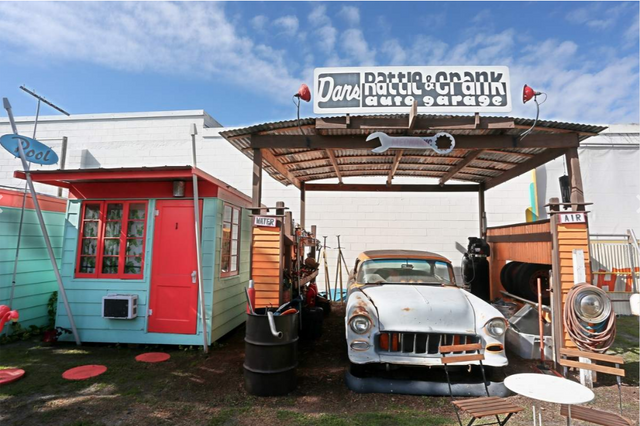 Next door to that is Dan’s Rattle and Crank, Tiny Town’s auto shop. 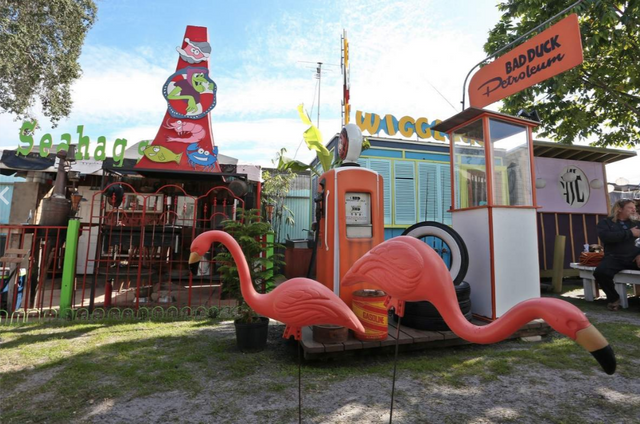 Then the Flamingo Motel. It has just one room with a twin bed, but there is a swimming pool. That’s across from the single-pump gas station, and the Asian bathhouse, with functional shower. Tiny Town’s trailer park is currently under construction. Keep in mind this is all on less than an acre, a lot less, though Painter isn’t sure exactly how big the property is. Painter spent five years building his tiny fiefdom. It’s immersive, detailed and tropically colorful. It definitely has an Old Florida vibe. In reality, both are true. Painter built everything, but from found materials or scraps that were donated to him. He salvaged all the paint from the dump. Sure enough, out front near the sidewalk was a big stack of white boards. He wasn’t sure who’d left them. Every building in Tiny Town represents a piece of Painter’s life. An era, a job, a childhood memory. In the back of the lot is the Officer’s Club, a nod to his “dads,” father and stepfather, who were in the military. Painter, 56, wanted to be a Navy pilot. Wore a crew cut for years as a young man, got into the Navy’s Aviation Officer Candidate School, but his eyes weren’t good enough to fly. Plan B? Artist. He has been called the Sasquatch of the St. Petersburg art scene. He’s known as an artist’s artist. “He’s been around forever, but it’s always a rare sighting when you see Dan Painter,” said muralist Derek Donnelly. “It’s, ‘Oh my god, there he is.’ "
There was a little evidence of him around the city, like those eye-catching sculptures of horned, humanoid creatures mounted like hunting trophies in the now-defunct Amsterdam bar, but they didn’t even have his name on them. A friend, he said, was basically just storing them there for him. He had another art studio in the Warehouse Arts District, years before someone got the idea to promote the rough industrial neighborhood with that aspirational name. But his large-scale sculptures, like a galloping Four Horsemen of the Apocalypse that incorporated real horse skeletons, did not fit in neatly with the kind of stuff tourists buy to stick in their bathroom. He has never shown his artwork. Never been in a gallery or taken part in a sidewalk art festival. He preferred to swing a hammer as a carpenter to make money, which meant he could make art to keep it or to give it away, which is how he prefers it. There’s something to be said for his lifestyle, said Gordon Rothwell, a friend and fraternity brother at Florida Southern College, now a lawyer in St. Petersburg. Painter said he has been homeless twice, once in South Florida and another time when he was stranded for two years in the Ozark Mountains. He looks like a burlier version of Jeff Bridges’ “The Dude” from The Big Lebowski, and certainly has carefree, easy, dude-ness. Sipping his black iced coffee from a mason jar, he said his foremost desire in life is to finish his projects, like Tiny Town, and his primary joy comes from working on them. Outside of that, it’s about having a few beers at the end of the day and watching Jeopardy! outdoors with the friends who stop by. The Tiny Town property, on Emerson Avenue S and not far from the Duncan McClellan Gallery, was nothing but a dirt lot without water or electricity. A lot of Painter’s possessions were destroyed by the rain — a “great purging,” he calls it. He didn’t work paid jobs, just worked full time on the town. He has no money to speak of, but it doesn’t feel accurate to call him broke. Friends bring him clothes. Strangers who visit the town — there have only been about a dozen so far — have sometimes given him a few bucks for a burger, or some chlorine for the motel pool, but he said he’d never ask anyone to pay for a tour. That doesn’t mean he wouldn’t like to make some money. 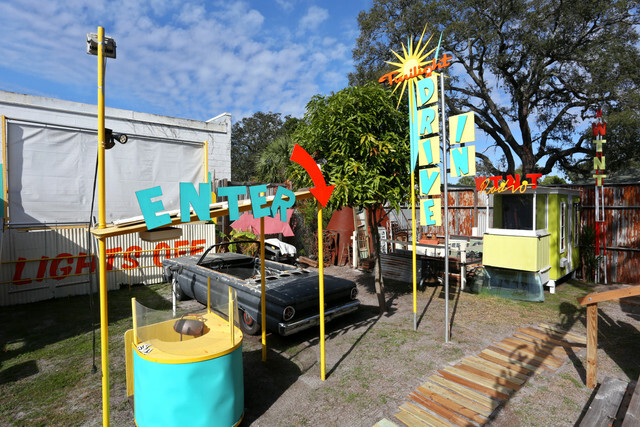 Tiny Town used to have a hardware store, but that has since been sold and installed in a backyard in Tampa. He’d be happy to do the same with some of the other buildings, but avoids naming a specific price. He also has plans to rent the place as an events venue. Corporate parties at Tiny Town? Weddings at Tiny Town? Sure, why not. Most fulfilling though, he said, will be if people finally see and enjoy it. He’d be happy to have you stop by.